The subject comes up relatively often – what’s the best meal you ever had? (Or as Food Network would put it – the best thing you ever ate?) For the past few years, I would tell you, without hesitation, that it was the romantic dinner David and I enjoyed at The Hobbit in Orange, after I agreed to not drag David to my high school reunion. Best bribe ever, and I would do it again in a heartbeat. So when I got an email that The Hobbit was offering a special deal for Easter, we jumped at the chance to introduce our daughter (who has become quite the foodie herself) to the wonders of fine dining. Going to the Hobbit is like going to one of those fancy dinner parties you see in old movies – even the restaurant itself is a renovated mansion not far from Old Town Orange, dripping in ivy and adorned to whisk you away to a time when California was still a young state. We showed up in our fancy dress (a must for The Hobbit – jeans here just look sloppy), and were immediately greeted by the owners, who welcome guests as if they were long time friends. We were given a short tour of the house, then left to roam freely until the official start of the proceedings. Outside of a lack of beds and an excess of dining tables, the house looks much as you might imagined it looked many decades ago with a strong art deco theme throughout. After exploring a bit, we got a couple cocktails from the bar (and a soda for the little one) and relaxed in one of the upstairs dens, taking note of our fellow guests and admiring the historical decor. Shortly thereafter, everyone was summoned down to the wine cellar to enjoy champagne and hors d’oeuvres. 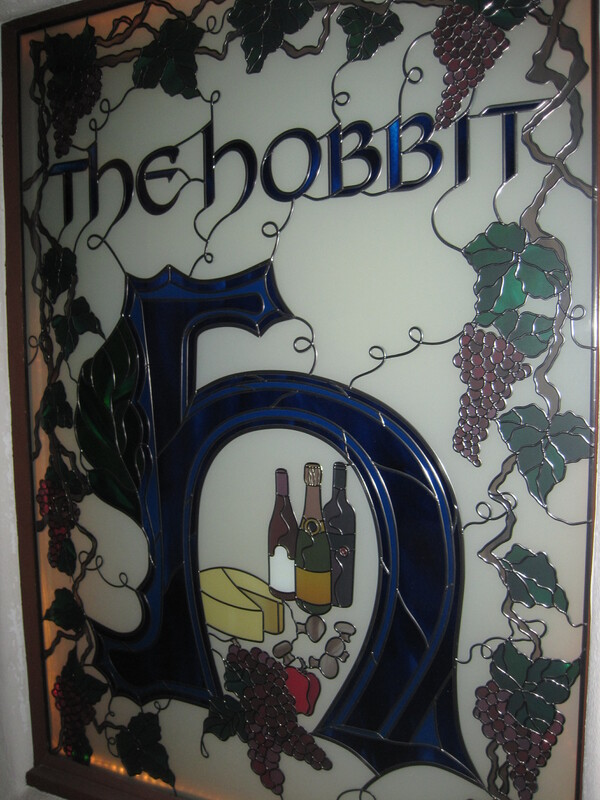 Because there is limited seating at The Hobbit, the cellar is full, but in a cozy sort of way with hors d’oeuvres set on tables throughout so that you are encouraged to wander and mingle, perhaps sample the wine offerings and make selections for the night’s meal. The hor d’oeuvres are fantastic and really set the stage for the whole night. All the classics are here: caviar, foie gras, little cucumber bites with a smooth yogurt filling. You could imagine, for a just a moment, you are a well to do debutante at the turn of the century, enjoying her first formal evening in the home of a beloved aunt and uncle. Or at least I can. It’s one of the things I love about this restaurant. The absolute standout for us, though, was a simple but brilliant take on the grilled cheese sandwich – delicate flaky puff pasty layered with gooey melt in your mouth guyere cheese. It matched especially well with The Hobbit’s own house bubbly, which has a clean refreshing taste to it – something I appreciate, being not a big fan of sparkling wines myself. 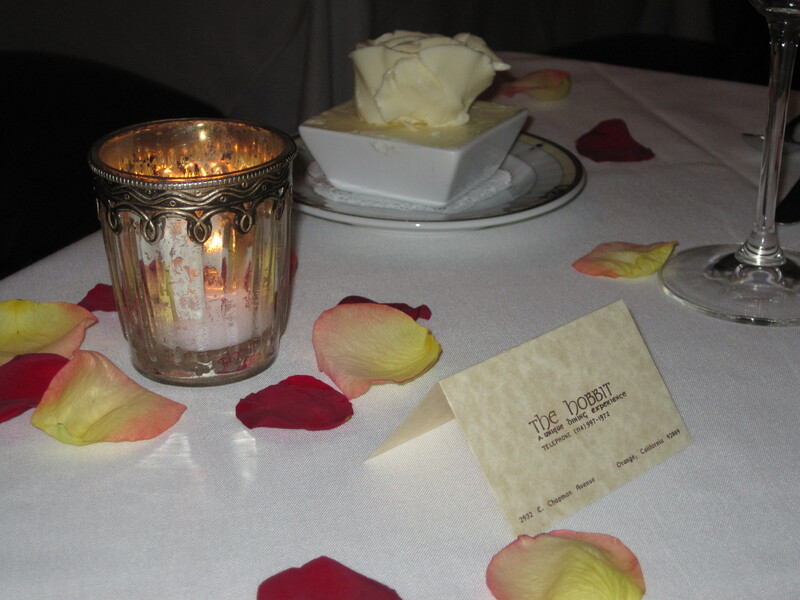 Act one completed, we were escorted up to the dining rooms, where each party had been assigned their own table, complete with place card, and a butter urn wherein the butter had been carefully formed to resemble a blooming rose, not unlike the ones that donated the rose petals strewn carefully over the tablecloths. The candlelight tops off the effect. If I ever come into big money, I will have a party here and everyone will be required to wear tuxedos and ballgowns. It’s that kind of place. Each course is served with The Hobbits amazing dinner rolls. I don’t know what’s in them, but it’s a damn good thing they only give you one per course and not leave you with a whole basket because I would eat a dozen without hesitation. I remembered them as the “best dinner bread I ever ate” and they lived up to my expectations this time around as well. Oh yeah, and then we were served dinner. (Dining at The Hobbit is an experience to be savored. Expect to be here all evening.) First course was a delicate poached halibut served in a delicious corn sauce described as “sweet corn nage with mache greens”. Since we’ve got several courses to cover, the serving is about the size of a pack of cards, but every bite is full of flavor as the halibut just melts in my mouth. Perfect. It is matched with a Pinto Grigio Dolomiti from Italy. I have no idea what that means, but the wine compliments the seafood nicely. Not long after we finish this course and have had time for a bit of conversation, the sommelier comes around and replace our wine glasses, now serving us something called “Casa Basa” which apparently is imported from Cotes du Rhone Villages in France. It is a good compliment to the next course – a cut of lamb served with a size of fava beans and farro. Although the mention of fava beans and lamb tempts me to bust out the Hannibal Lector impression, I refrain and instead just enjoy the juicy meat dish. I am a big fan of lamb and this was quite good, although later we all agreed it was one of the less successful dishes, as the lamb is a bit underdone for our liking. And with that I will close part 1. Part 2 will be posted tomorrow.